Devlin attended Georgetown University in Washington, D.C., where he played baseball and football. As a senior in 1900, he served as the team captain. He was a standout back, and in 1900 was considered competitive for the Walter Camp All-American team if it had not been restricted to Harvard, Yale, and Princeton players. He served as the head football coach at North Carolina A&M, now North Carolina State, for the 1902 and 1903 seasons. During that time, Devlin's teams compiled a 7–8–2 record for a winning percentage of .471. In the early 1920s, Devlin served as the head baseball coach at Fordham University. In the late 1920s, Devlin served as a basketball coach at the Naval Academy. Devlin spent most of his 9-year baseball career with the New York Giants, where he started as their third baseman in 1904. 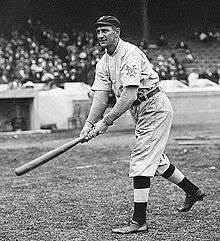 In 1905 Devlin stole 59 bases, sharing the National League lead with Billy Maloney of the Chicago Cubs. Devlin was traded to the Boston Braves in 1911, where he played for two years as a backup infielder until his retirement in 1913. Devlin had a short temper and on one occasion in 1910, jumped into the grandstand at the Polo Grounds to beat up a fan who called him a "dog". Art Devlin died in Jersey City, New Jersey a month before his 69th birthday. ↑ Georgetown Football Awards: Team Captains, Georgetown University, retrieved February 26, 2009. ↑ Georgetown Football: Timeline, Georgetown University, retrieved February 26, 2009. ↑ Arthur Devlin Records by Year, College Football Data Warehouse, retrieved February 26, 2009. ↑ Coach Arthur Devlin Makes First Cut in Baseball Squad, New York Times, March 28, 1920. ↑ Coach Arthur Devlin Gives Players Workout on Diamond, New York Times, February 13, 1919. ↑ Georgetown Basketball History Project Archived May 18, 2009, at the Wayback Machine., Georgetown University, retrieved February 26, 2009. ↑ Fleitz, David L (2009). The Irish in Baseball: An Early History. United States: McFarland Publishing. p. 200. ISBN 978-0-7864-3419-0. Wikimedia Commons has media related to Art Devlin.